In the Review on Antimicrobial Resistance (AMR), Lord Jim O’Neill called for a Global AMR Fund with $2 billion over five years. In the past few years, we have seen impressive efforts of new initiatives for research against drug-resistant infections, starting with BARDA, NIAID, Wellcome Trust, JPIAMR, and ND4BB’s ENABLE and TRANSLOCATION projects. In 2016, CARB-X was launched to fund and support innovative early development, GARDP joined the team as a developer, and 2018 saw the addition of the newest entrant, the REPAIR Impact Fund. Together, these represent about $1 billion in new resources devoted to supporting AMR, half way to Lord O’Neill’s goal. Laudable progress, but much remains to be done to get new products over the finish line. CARB-X can fund only a fraction of the applications received, and private capital is scarce for costly phase 2 and 3 clinical trials, so we need to increase with push incentives. Most distressing is what happens once these drugs overcome daunting odds and actually get approved by regulatory agencies. Most innovative drugs reach the market with either significant sales or premium pricing, or both. For antibiotics, the opposite is true: poor volumes at bargain prices, as the DRIVE-AB team documented, and plus, we don’t want large volumes due to antibiotic resistance. The best-selling antibiotics struggle to generate revenues to cover the cost of goods sold. Some 75 percent of US antibiotics launched since 2009 are being sold at a loss; none are in a position to recover R&D investment. 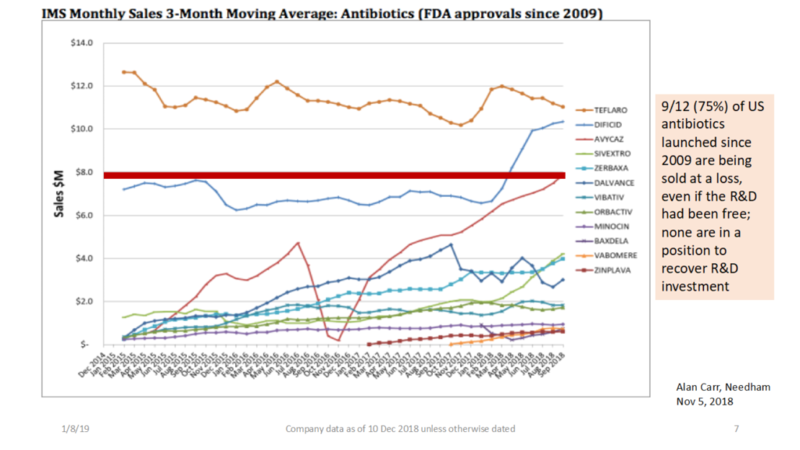 No wonder oncology and hematology had 239 new molecular entity (NME) approvals from the FDA from 2008-16, while antibiotics had only 9 in that same period. We need fundamental reform to how antibiotics are reimbursed in the market. To ensure a sustained pipeline, we must pay based on value to society and medicine. That means delinking reimbursement from volume. The UK’s recently announced 5-year national action plan calls for a pilot project to reimburse antibiotic developers based on how valuable the drugs are to the National Health Service (NHS), rather than on the quantity of antibiotics sold. In launching this pilot, the world’s first antibiotic reimbursement pull incentive, the UK is demonstrating leadership and vision that hopefully will help inspire a new global economic model for antibiotics. Other countries, including the US, are also considering different types of pull incentives or market entry rewards, as well as fundamental reforms to antibiotic reimbursement. They should be encouraged to take bold steps and coordinate efforts globally. None of this is easy, but we must continue to push forward. We need both push and pull incentives to beat drug-resistant infections. If we don’t get this right, we risk jeopardizing many of the scientific advances of modern medicine and putting more lives at peril. Kevin Outterson, J.D., is the executive director of Combating Antibiotic Resistant Bacteria Biopharmaceutical Accelerator (CARB-X), a Boston University global non-profit partnership that focuses on supporting the developers of promising new antibiotics, diagnostics, and vaccines that tackle the threat of drug-resistant bacterial infections. CARB-X is funded by BARDA/ASPR/HHS, the Wellcome Trust, the National Institute of Allergy and Infectious Diseases, the UK Department of Health and Social Care, and the Bill & Melinda Gates Foundation. CARB-X funds the world’s largest portfolio of preclinical antibacterial products. 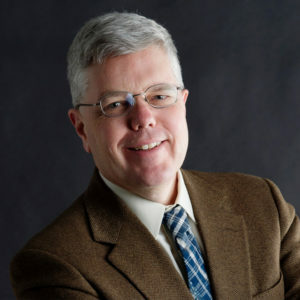 He teaches health law and corporate law at Boston University School of Law, where he co-directs the Health Law Program and is the N. Neal Pike Scholar in Health and Disability Law. The opinions expressed in this article are the author’s and do not necessarily represent the positions of CARB-X or its funders or partners.